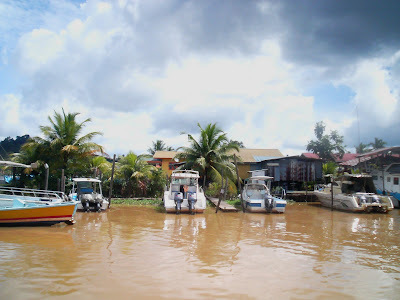 Just the other day while passing the Kampung Baru village, I saw these twin-powered 200 horsepower speed boats moored by the Sebiew river,Bintulu. These boats are normally used to go offshore by timber merchants or traders to inspect their logs before loading into foreign timber ships that are anchored about 10 - 15 km off Bintulu coast. They are also rented by tourists and deep sea fishing enthusiasts to offshore fishing spots some 75-100 km away to sea. Tourists use them to cruise the Bintulu coastline or to upriver for outboard riding.